All types and forms of slider, gallery, and image plugins are compatible with Popup Maker. Simply entering the shortcode for your slider into the Popup Maker content editor, and our plugin will create a popup that displays your slider! Depending on what slider builder or plugin you're using, the slider content may appear too small (thumbnail), or not appear at all. As such, the slider ends up with heights of 0 to 50 pixels depending on the presence of a popup title (thumbnail). In other words, the popups are not visible when they initialize the sliders. In the Popup Editor, scroll down to the Popup Settings box, and select the 'Display' option -> 'Size' category, and set the 'Size' option to 'Custom'. By default, the plugin sets the popup width to 640 px (pixels) and height to 380 px. 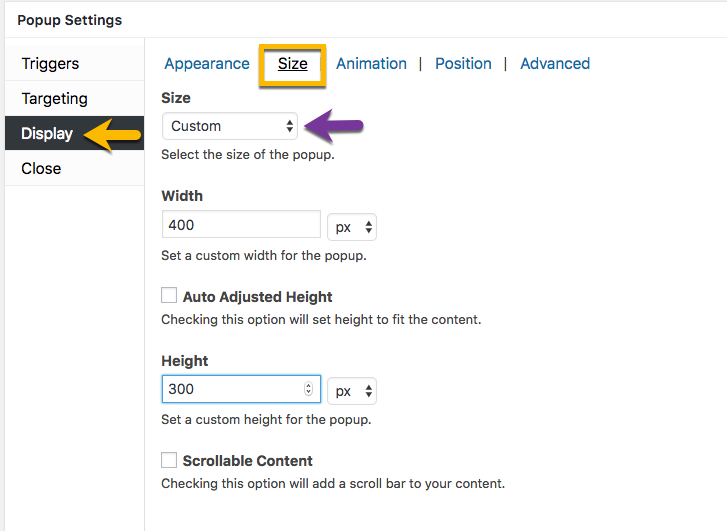 Set the custom width and height attributes for your popup. The screenshot below assigns a popup width of 400 px and height of 300 px. If you use CSS, you can use media queries to scale it for different devices. An alternative to Solution #2 is to add the following custom code to your Slider Revolution. Learn how to add custom code to your Slider Revolution. 2) the editor of a WordPress plugin such as 'My Custom Functions'.